Tullyboy Farm is a family run real working visitor farm in a beautiful setting around a Georgian farmhouse and buildings with mature trees and lake views on the Roscommon and Leitrim border between Boyle and Carrick on Shannon and less than an hour from the Wild Atlantic Way. The attraction offers fun, educational and cultural activities for families, and all types of groups in a safe environment. 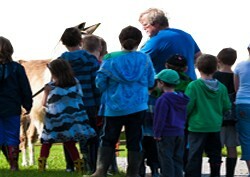 There is a whole range of activities available, from miniature tractor barrel rides, straw dives for goodies, playground, lots of animals to get up close to and hand feed and cuddle, tractor trailer rides (if sufficient numbers permit), pony rides by lead rein (when available). Most of these are included in the day visit at no extra cost so it represents great value for money. Farmer Matt specialises in providing guided tours for groups especially School Tours which last 3 hours packed full of fun and education. We also run special events on long weekends including Easter egg hunts at Easter weekend and ram racing with teddy jockeys, tug-o-war games etc. over the bank holidays in the summer. Our Halloween and Christmas Experience events are one and a half hours long should not be missed. We have featured on lots of TV programmes down through the years including Nationwide, Ireland AM, The Den, TnaG and have had many famous visitors over the years. Farmer Matt and his family will do their utmost to make your visit a warm, welcoming and enjoyable experience.